[dropcap]S[/dropcap]pring is finally here with summer right around the corner. I love all the good fresh vegetables that start to pop up. The other day I found a pack of heirloom cherry tomatoes that looked so good. So I knew I had to put them to use somehow. Tomato, basil and mozzarella (caprese) salads are one of my favorites in the summer time. Originally I thought I could make one of those. 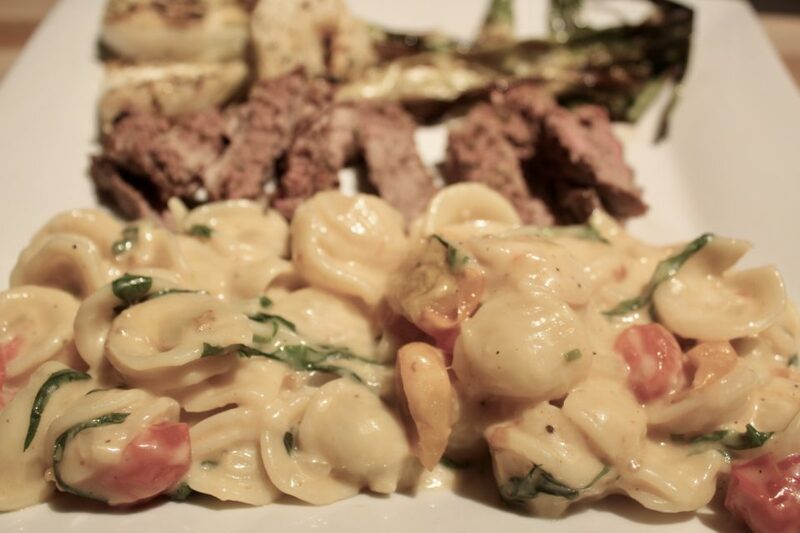 On the weekends however, we like to make one indulgent meal. Usually we eat healthy all week and lately have been cutting back on carbs. I was craving mac and cheese and had an “a-ha” moment – why not combine the two? 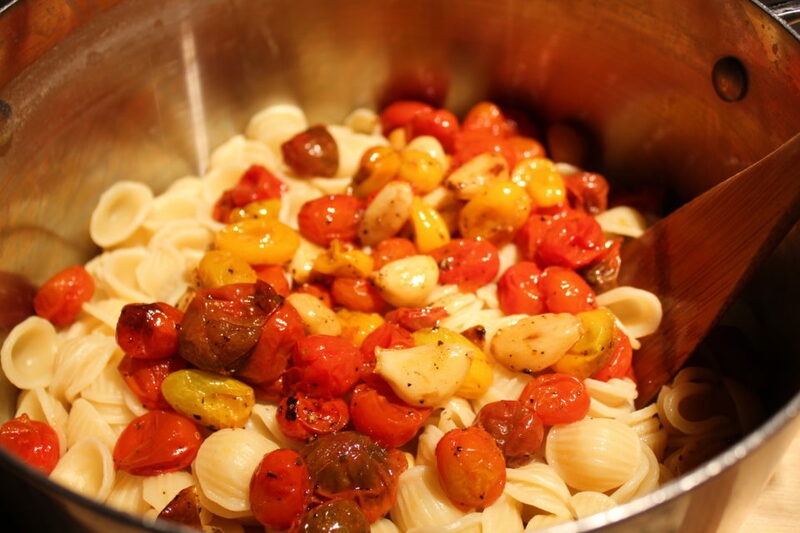 Roasting cherry tomatoes in the oven has become a method I love to use. Not only do they come out flavorful, they are really easy to make. To start I drizzle the tomatoes with olive oil, sprinkle on some salt and pepper and add whole cloves of garlic. Then this mix bakes in the oven for about twenty five minutes until the tomatoes start to turn golden brown and the skin blisters. I have experimented with cheese sauces for years. I feel like I finally have a method and mixture that works well for me. For years I struggled with grittier sauces. I don’t know if it was the cheese, the pasta I was using or the method but either way it wasn’t pleasant. The taste was still good but the texture was always off. But not anymore! Now in all my mac and cheese sauces I consistently do a few things regardless of what kind I am making. First in my roux I ALWAYS cook the flour a few minutes. This prevents the flour from tasting raw in your sauce. Secondly, I ditch the milk! So you probably are thinking, how do you make mac and cheese without milk? By using broth. I prefer chicken broth but veggie broth would work as well. While you cut down calories and fat you don’t lose any flavor. 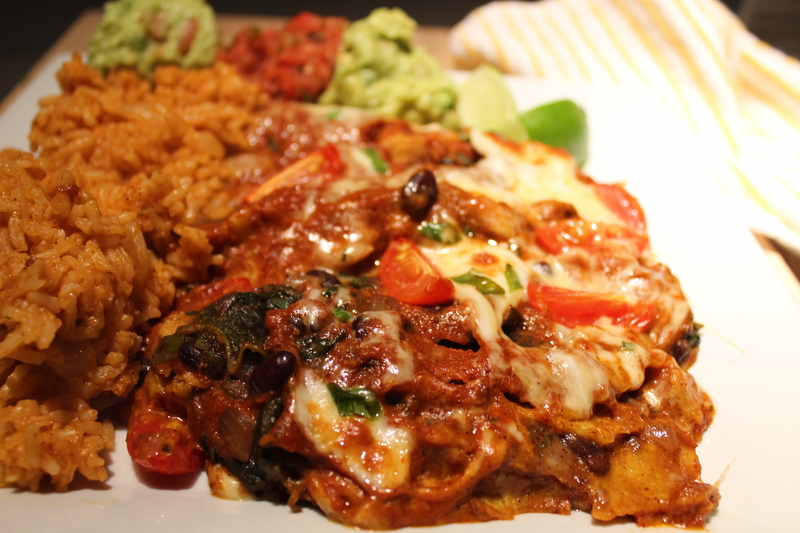 Additionally, once my sauce has come together and it’s time to add the cheese I remove the pan from the heat and slowly incorporate the cheese handfuls at at time. 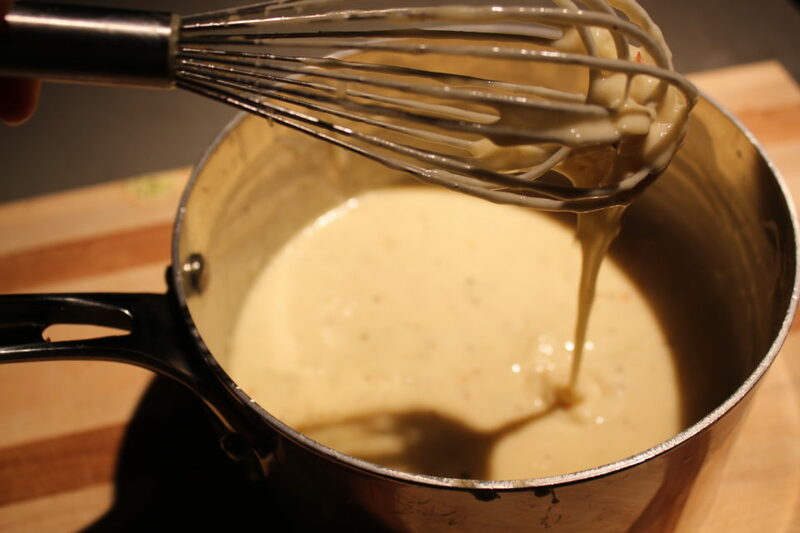 All of these tricks have helped me refine my cheese sauce over the years. This meal is great for mutli-tasking. Typically I start my cheese sauce while my tomatoes are roasting in the oven. About half way through the tomatoes cooking I turn on my water to bring to a boil. Then when the pasta is cooking I finish making the cheese sauce. 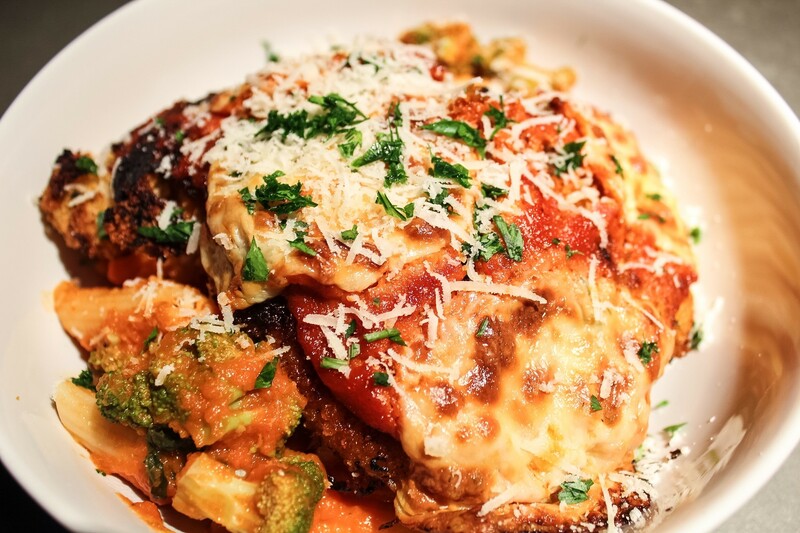 Putting a new twist on old favorites can be fun. Especially when you combine two favorites into one! 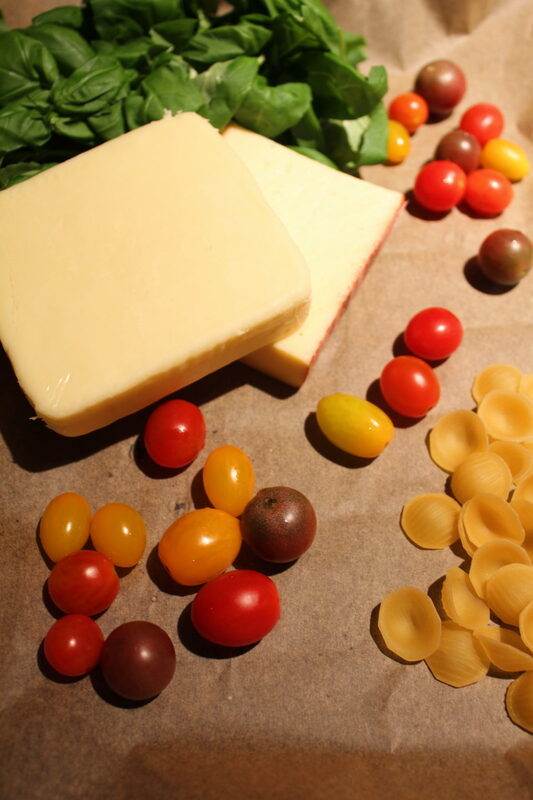 Using fresh seasonal ingredients add a brand new dimension of flavor to this old classic. Think of it as a new twist on pasta salad. 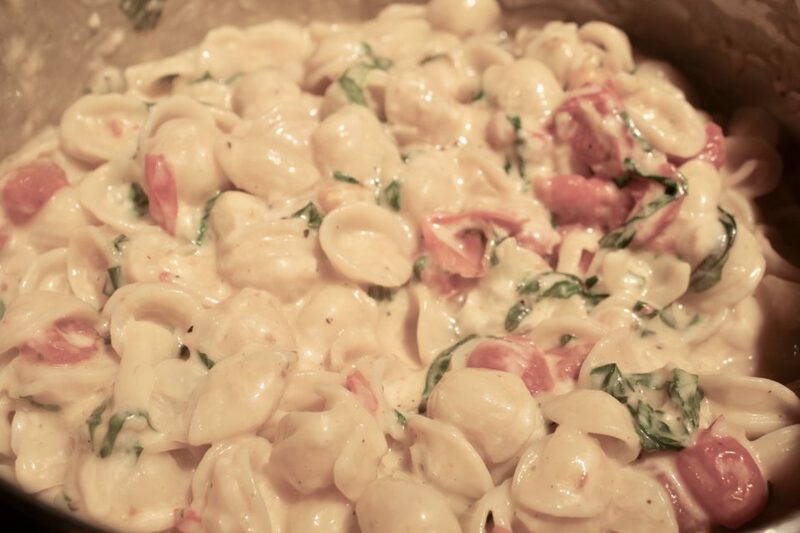 This caprese mac will make you have a new appreciation for the trifecta of tomatoes, basil and mozzarella. Prego! 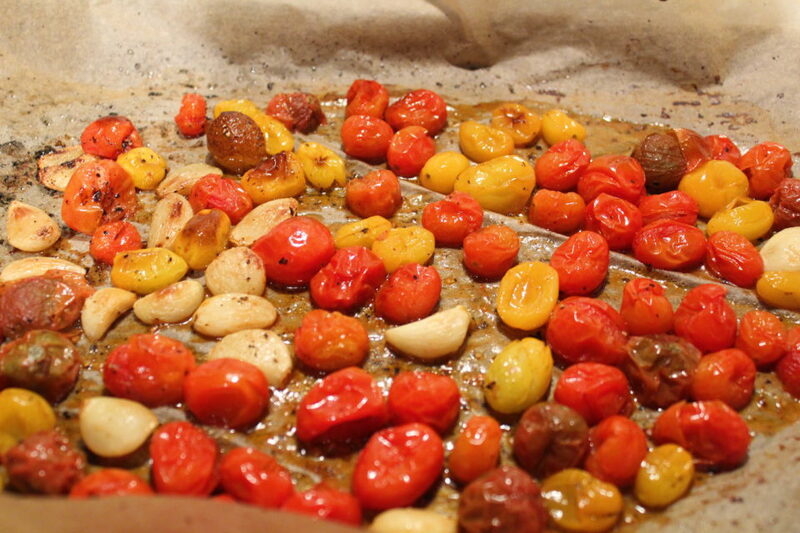 On a cookie sheet lined with parchment paper lay out cherry tomatoes and whole garlic cloves. Drizzle with olive oil and season with salt and pepper. Bake 20-25 until tomatoes are golden brown on top and blistering. Make sure to give the pan a shake half way through. In a small sauce pan melt butter and sautée onions and minced garlic over medium low heat 10-12 minutes until onions are soft and tender. (try a small bite to make sure onions are not raw). If using red pepper flakes cook them with onions. Once onions are cooked, add in flour and cook for a few minutes stirring to incorporate into the onion mix. Turn heat up to medium high and add broth. Season with salt and pepper to taste. Go easy on the salt to start as the cheese will provide some as well. Whisk to remove all of the flour lumps. Bring to a low gentle boil and continue to stir and whisk. The mixture will start to thicken up. While pasta is cooking, turn the heat to low on broth/onion "sauce". A handful at a time whisk in cheese. Make sure the cheese is blended through and then add another handful. Do this 3-4 times until all the cheese is stirred in. Taste the mixture and season with more salt and pepper as necessary. 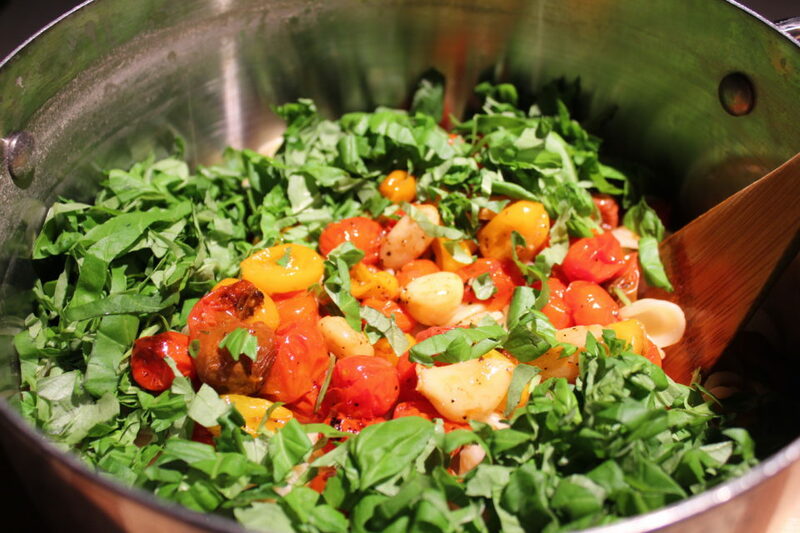 Once pasta is done, drain and add back to the cooking pot. Add in the tomatoes and roasted garlic and all of the juice that has released onto the cookie sheet. Slowly stir in the cheese sauce. Add in basil and mix throughly to combine. Season with more salt and pepper if needed. Serve as a meal or a side dish. If you can, try to buy cheese that you grate. Pre-grated cheese have an enzyme sprinkled on so the cheese stays separated but this also makes mac and cheese gritty and sometimes hard for the cheese to fully incorporate into the sauce.